Postcard from Naples 3 - This one is more difficult than it looks. 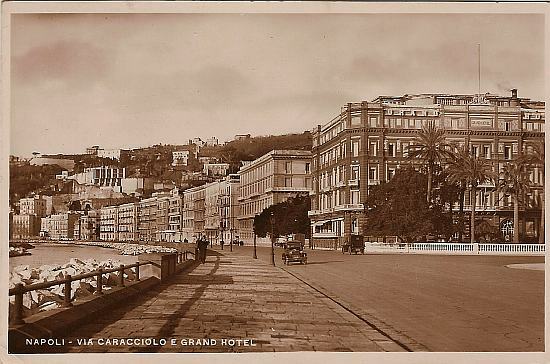 The easy part is the location; the postcard tells us that this is "Naples - via Caracciolo and the Grand Hotel." You are standing just a few feet from the rocks of the breakwater along the coast. The view is to the west; that is, the main body of the city of Naples is about a mile behind you as you face that gentleman walking towards you. The west end of the long Villa Comunale (the public gardens and park) is across the street on your right. Ahead of you, about where the long curve and the buildings end, is the small port of Mergellina. The wooded hill above it all is the Posillipo section of Naples. The Grand Hotel shown on the card was also part of the same plan to renew the seaside. The hotel was finished in 1880. There were other hotels in Naples from about 10-20 years later also called Grand-this and Grand-that. This was apparently the first one. It has almost nothing of the floral wreaths and ornamentation of the Art Nouveau style then about to become popular all over Europe. It seems more of the "eclectic" school, somewhat like the Stock Exchange in postcard #2. In terms of dating this card, however, it is important to note that the hotel is no longer there. It was badly damaged in WW2 and replaced after the war by what is now the U.S. Consulate (large photo, here). It is interesting how many old-timers look over at the consulate and call it "the old Grand Hotel." Hard to say. I suspect, but am not sure, that since the dimensions and orientation of the consulate are virtually identical to the old hotel, the hotel was not destroyed (as some sources says) but badly damaged, salvaged and turned into an example of then recent Rationalist architecture. The consulate even saved (or rebuilt) the white semi-circular balustrade in front. Still not much of a real date on the card: obviously between 1880 and 1943. Not much. The cars might be of help. There are only two. The easiest one to guesstimate is the one facing you. It might be a model of the boxy FIATs built around 1930-34, or perhaps another make of car but roughly the same time frame of 1930-35. The car can give you a no-earlier-than date, but that's all. That is, if we can say, roughly, that the car is 1935, the card cannot be from 1925. But what about no-later-than? We have one of those: 1943. Can we narrow it down further from the vehicle? I don't think so. I drive around in an old FIAT; maybe that's what this guy was doing. I don't think that the few cars (two!) on the road can be any more help. From the shadows, the photo was taken in mid-afternoon (maybe 2 or 3 p.m.), but it might have been a Sunday or the photographer might just have waited for a propitious moment. Besides, there weren't that many cars in Naples in the mid-1930s, anyway. In 1936 the population of Italy was 43 million. There were about 220,000 cars in circulation. That's about 5 cars for every 1000 persons. Applying that to Naples of 1936 with 865,000 inhabitants (shaving a bit because the percentage of car owners was higher in the north) you get, very roughly, only 4,000 privately owned cars in Naples in 1936, so the lack of cars in the photo (even if typical) doesn't mean much. Is it possible that the card is closer to 1940? Are there any indicators for that? Yes, and I think I am leaning a bit towards the late 1930s for a date for this card. There are two items of interest. The card shows the hotel, yes, but there are few changes from the original. The original facade (from an 1885-1890 photo) looked like what you see on the right. A closer view of the hotel facade on the postcard is on the left. See what they did (besides adding another story on top!)? What are those letters up there on the south side of the facade in the postcard photo?— G-R-A-N-D. (H-O-T-E-L is on the other side.) They have re-identified the building as the Grand Hotel on either side of the original name that is chiseled into the architecture. Why would they do that? —especially since the letters almost deface the facade! Note that the letters are not painted on; the shadows show that they are three-dimensional. They are mounted in place. They are also very big —too big. The only thing I can think of is that they were put there so people coming from the east on via Caracciolo or maybe through the long park would notice the name from a distance. If you could illuminate the letters, they would be visible even at night! That would require some kind of fluorescing technology. That technology was available in, say, 1937-8, but probably not yet in wide commercial application. But it's plausible. I think my last word on this has to do with the person I referred to up at the top--"the gentleman walking towards you." At a higher resolution and in close-up, he looks like this (image, right). 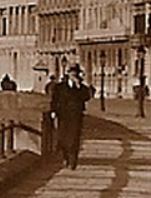 Maybe it's the hat or the suit or just the general "cut of his jib" (we old salts talk like that —I took a kayak out on the bay once), but this man did not just walk in out of the 1920s (already established, anyway, from the car). I'm guessing late 1930s. If you are a car buff, or that rarest of all buffs (fluorescent lighting technology), I want your views. Or if you are a dapper paragon of sartorial splendor, I don't believe you, but write me anyway. So, car plus shaky fluorescent lighting theory plus cool-looking guy...I'll say 1938. If you have any quibbles or further ideas, by all means let me know.